After years on portable consoles starting with the PSP then Nintendo 3DS, Monster Hunter is back on consoles and on PC at later stage this year, with the hope to renew the franchise in a way to satisfy the needs and wants of veteran hunters and attracting a new audience. 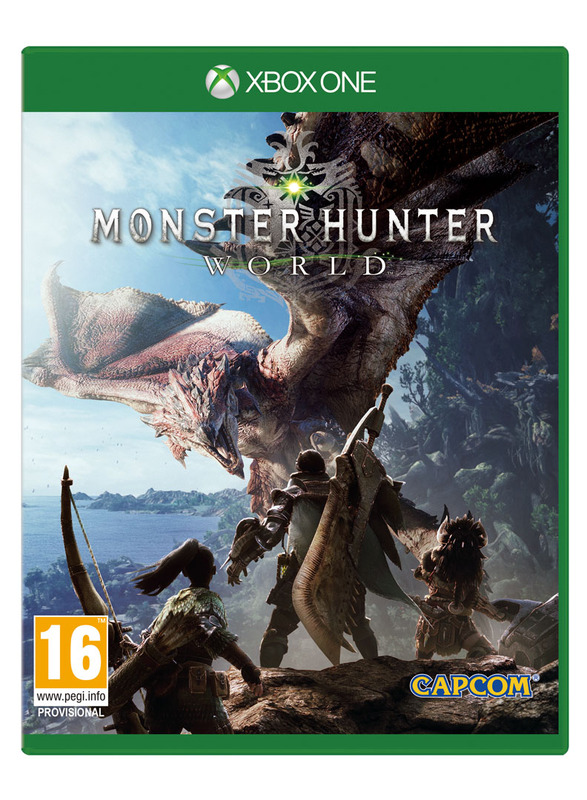 A major challenge for the brand, considering that the majority of its fans are in its home turf of asia where it thrives, it had quite a niche fan base in the west, and so Capcom hopes to break that mold with Monster Hunter: World, which we got plenty of time to review on both Xbox One X and PlayStation 4 Pro. In Monster Hunter: World, you play as a bounty hunter who begins his journey to an unknown world, in what would be his fifth expedition. The whole premise for your seasoned hunter is to discover why elder dragons, and their alpha known as Zorah Magdaros, a gigantic monster as big as a mountain, are also traveling to this new land. And so the adventure begins aboard a boat that leads you to this newfoundland, where you kick off your interaction in the game with one hell of a hero creation tool. Probably the most complex of any Monster Hunter, the character builder is full of customization options, which will bring please in creating a unique hunter, whether you want him to look like a serious bulky monster killing machine, or even a quirky adorable but deadly hunter. If not, you can pick one of the predefined models of course available and play around many item which are mostly not locked to any gender, thus creating some funny avatars, and that’s without creating your Palico. If you’re not a Monster Hunter player, then you would not be familiar with Palicoes, but they are pretty much cat-looking creatures that support you like sidekicks, previously introduced in Monster Hunter 4 Ultimate. And so we are ready to start, after a decent and solidly made cinematic of the game, with our hero – mostly silent – in something that Monster Hunter never did in the past, which is a more structured and scripted core campaign. This is will be done via a series of main story missions, with multiple phases to prepare you mainly for a major hunt, full of tracking steps and collecting clues in the wild, to track your target, or even escorting allies through a dangerous zone. Some Monster Hunter: World quests are even extremely scripted with no room for freedom of choice, like your first encounter with Zorah Magdaros, but it’s mainly to add a bit of Hollywood or grand spectacle to the game, something that truly tosses the series in a new era of entertainment. It is not only by its narrative differences and structured script that Monster Hunter: World stands out from its predecessors. The level design have also undergone profound changes, which are around 5 different styles, and while it might seem little for a veteran in the series, you’ll understand why there was a need to this limit. The places visited in the game, which are now part of an open-world system, are in any case magnificent, and offer diverse panoramas and landscapes. Between the lush forest of the game’s beginning to the coral plateau overflowing with colors, each breathing with a sense of being alive thanks to day/night cycle, it’s one feast for the eyes. In addition, the levels lose the traditional way of being cut in segments thanks to the open world setting, which reduce the loading time, and can lead to some spectacular situations when major monsters sharing the same ecosystem end up fighting each other, while you’re hunting for one of them. While this transformation of the level design is definitely a success, I’m a bit suprise of the low count of major monsters to a mere 30, but again it’s very relative, because this is pretty much a new version of the game. As for the new critters, i’m a big fan of the Anjanath, which is a fusion between a T-Rex and Dilophosaurus, or even the Kulu-Ya-Ku, a giant chicken reptilian or my favorite Elder Dragon known as Kirin which is an electric unicorn. One of the other aspects of the franchise that evolves with Monster Hunter: World is the great gameplay mechanics that have barely changed over the years with each franchise. From the early start until the last Monster Hunter 4 Ultimate, control, gameplay and and exploration mechanics were pretty harsh and stiff. In Monster Hunter: World, all of the core weapons you are used to are there, but their handling was slightly revised too, for a result overall much more fluid and better fit to new generation consoles and higher framerate gameplay. Even the lock on an enemy, a mechanic that only recently appeared in the series, evolves to its full potential with a real sense of added dynamism to the combot. Then comes the Scoutflies, which deserves its own focus in terms of novelty to the mechanics of Monster Hunter. These small luminous fireflie-like insects are a new too hunters can use, to trace the scent, drool or blood of a monster, as well as highlight loot around to pick up. Combined with the map, which is updated in real time, you have all the necessary tools to make the collection of crafting items way easier and less of a hassle. In short, the ideal for a more pleasant exploration of these large open world areas, which also have a significant verticality in comparison to other franchise titles. Finally, there’s the city of Astera, which serves as a central hub for the game, which is simply gigantic and bursting with life. At first for the franchise, this hub has shortcuts to move faster within its streets, and is full of shops, contracts, fetch quests, sidequests and of course main missions. But the place where we will probably spend most of his time is in the smithy, to craft all these new armors and weapons out of your monster parts and materials. The activities at Astera are numerous and we return to this hub with pleasure between each mission to get new ones, and eventually end up spending a good 20 hours. To actually complete the game, you’ll require hell lot of end-game farming, which tick perfectly a modern day RPGs tickbox. In Astera, you will not only find NPCs but other hunters in the Gathering Hub, to join multiplayer arena quests and be part of 50-hunter squad, similar to MMO guilds. The beauty is that the difficulty is scaled from these missions based on the amount of players in the hunt. You see both singleplayer and multiplayer is fused together in this episode, so the difference of difficulty fluctuate depending on whether you’re playing alone, with a friend, two or finally three. Now considering that Monster Hunter hasn’t been back on a home console for a while, I have to focus on the the technical part of the game more than before. While a colleague of mine, we had the chance to do a lot of my test on a PlayStation 4 Pro as well as Xbox One X version, and the overall experience is pretty stable except very rare slowdowns. Now, even on new generation of consoles, it is clearly not a locked 60 fps, but rather drops to 40 in more dense areas. Yet there’s richer graphics, better animations, monsters that seem even more alive than any previous game, full of new interactions or more detailed equipment that really pays tribute to the hard work Capcom did to modernize the experience. On the other, if the title is capped at 30fps on the original PlayStation 4 and Xbox One, it sometimes has trouble maintaining the stability of its framerate when many elements animate on the screen, which is quite a regular aspect of the game. Falls below 20 fps are sometimes noted, especially in multiplayer when all of the 4 hunters unleash their attacks. We’ll have to wait a bit more sadly to see how Monster Hunter: World will fare on the PC when it comes out later this year, but I would expect everything from boosted textures and hopefully capability to run 60fps at 4K resolution. This game is also quite interesting when it comes to localization, with numerous options and languages when it comes to dubbing, as well as original Japanese, and even the original language of Monster Hunter known as Wyvernian. I should point out that for the Middle East version – whether you buy it in the regional PSN or Xbox store or retail SKU – includes game menus and subtitles as part of the day one update. Finally, on the audio part of the game, the Monster Hunter franchise is known for its soundtrack that give more tension to the violent duels between the hunter and his prey, to support the specific mood of certain environments or simply enjoy a quieter moment. This episode is no exception to the tradition with a rich soundtrack, haunting and regularly on the epic scale. Full of traditional instruments, the power of the brass emphasizes the intensity of the fights, while the violins can be calm and soothing in certain situations, while more nervous during combats. Veterans will easily recognize some of the iconic themes of the saga, reworked here in an orchestral arrangement. Monster Hunter: World was reviewed using an Xbox One and PlayStation 4 downloadable code of the game provided by Capcom. The game is also set to release on PC in late 2018. We don’t discuss review scores with publishers or developers prior to the review being published (click here for more information about our review policy). Monster Hunter: World is an episode worthy of the ambitions of Capcom's franchise, finally using modern platforms to do what was needed to upgrade the series, and able to attract both veteran hunters and newcomers. It clearly represents the future of the franchise, and we highly recommend you try it out, as it's a must-have whether you played any of the Monster Hunter games or not.